Radiation and scattering patterns calculations, in a form of 2D and 3D characteristics, including radiation parameters extraction, e.g. antenna gain, power radiated, radiation efficiency, axial ratio, etc., extraction of linear and circular polarisation components, calculation of radiation and scattering patterns in an arbitrary isotropic medium, etc. See also Radiation and Scattering post-processing for more information. Horn antenna with dielectric lens. Two dipoles in free space. One dipole near electric wall. 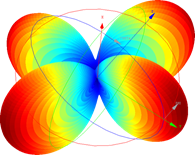 One dipole near magnetic wall. Plane wave illumination with the scatterer. Plane wave illumination of the infinitely periodic structure.